Conclusion: Through recombination, gametes contain new combinations of alleles. I 7.2 Recombination is the sorting of alleles into new combinations. each pair of homologous chromosomes assorts independently of other homologous pairs. With this new perspective, it is easy to see that the number of chromosomes in most organisms is limited and that there are certain to be more genes than chromosomes; so some genes must be present on the same chromosome and should not assort independently. 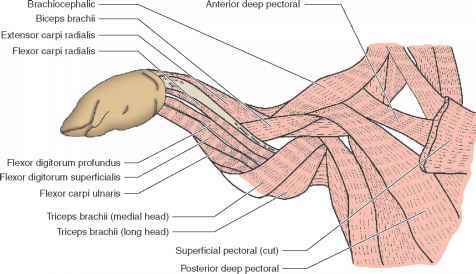 Genes located close together on the same chromosome are called linked genes and belong to the same linkage group. As we've said, linked genes travel together during meiosis, eventually arriving at the same destination (the same gamete), and are not expected to assort independently. However, all of the characteristics examined by Mendel in peas did display independent assortment and, after the rediscovery of Mendel's work, the first genetic characteristics studied in other organisms also seemed to assort independently. How could genes be carried on a limited number of chromosomes and yet assort independently? I 7.3 Nonindependent assortment of flower color and pollen shape in sweet peas. purple was dominant over red and long was dominant over round. When they intercrossed the F1, the resulting F2 progeny did not appear in the 9:3:3:1 ratio expected with independent assortment ( FIGURE 7.3). 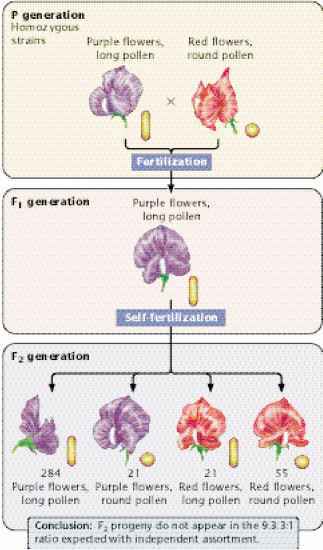 An excess of F2 plants had purple flowers and long pollen or red flowers and round pollen (the parental phenotypes). Although Bateson, Saunders, and Punnett were unable to explain these results, we now know that the two loci that they examined lie close together on the same chromosome and therefore do not assort independently.